I'm getting worse and worse at wishing a Happy new month. Seems like I used to be on top of that, every single month. I feel it, every first of the month, I say it in my mind, but I'm not as often at the computer, when I do think of it! I thought, actually, that I haven't been writing as much. But, when I look back through this time of year, every year, I just write less, this time of year. The board is less busy, this time of year, also. I think... Here's what I think. You ready? I think we all have Spring fever! Whoo hooo! Was yesterday Spring, or what!? I bathed in it! And, at the same time that extreme springtime- joy washed over me, extreme sadness likewise, thumped me in the heart. I miss Ginny. I lost Ginny to cancer this year. Oh, how she loved Spring time! I miss Andrew. I lost Andrew, six months ago, too. How he loved Spring time, also! Andrew is my son. Ginny is my best friend. They both were family. Now, before all of my friends say, "Gee. I thought I was your best friend." You are! I have several BFF's! There is no better thing than to have several "besties". "Best" does not have to imply singular! Andrew is my best son. BSF. (Best son forever!) Likewise, so is David. I kiss David on the cheek and say "I love you." And, oh. How I mean it! You know, he does that to me, too. Out of the blue. Out of nowhere. Like, when I get home from grocery shopping, or after David takes Willie out. I think it hits us both now, that we'd darned better do that kind of thing right now. While there is time. While we still have each other. I'm not kidding. Go! Do it. Right now. Go kiss the one you love. While there is time. While you still have each other. I left the doors of the house open, all day long. The heater didn't even think to come on! It was warm, muggy, almost! But, the smells were amazing! My sisters and I met for our annual Birthday breakfast and Linda, my sis, brought me a little bouquet of Daphne. Oh, my! It smells so wonderful! Everyone I met while carrying it, I insisted, "Smell this!" Oh, and were they glad they did! It now sits on my kitchen table, and the smell is so strong that it lights up the whole room! My Daphne is still waiting to bloom. I see little pink buds, but they haven't opened. I cannot wait! Having my own little bouquet has helped the waiting process, though! I can't wait to go look, this morning. Perhaps I have flowers, too? If not, someday, someday soon, I will open my front door, and that Daphne that I planted last year will have the most amazing Spring smells, and it will blast me, full on! I can't wait! Oh, dear. I keep thinking what a dummie I am. Here I have this wonderful portal where I can share things that are going on, and again, I have failed. I was going to go to the Sportsman Show, today. The Saltwater one, where they all the Saltwater tackle and business people gather in booths for everyone to browse the wares. It's at the Salem Fairgrounds, this morning, and tomorrow. I was kindly invited by "Fisher Jack". I was going to have my own booth, but it turns out that not many people needed to refresh their salty gear, so I declined the offer, this year. They are so kind to me. And here, I forgot to post about it , to let you know. I do hope that you are able to still go! If you didn't know about it, now you do! Now, pack up your wallet, and head out! There is still time! I just wish I would have thought to write about this earlier, darnit. I don't know where my mind is, sometimes. All I know is that I'm getting older, and on top of it, there have been so many stressful events in my life this year, that I just forget things. I just do! Also, I'd like you to remember the "Kings For Kids" tournament, and also the NSIA tournament. Both tournaments are so important, so fun, and you can read about them, here! OK, another Spring time warm day to explore this planet that we are on! Get out there! Do stuff! Get your hands dirty in the garden! Most of all, treasure each moment! Willie loves flashlights, as we all know. Right? So, last year, he lost one of MY flashlights. You know, the good Coast ones. I loved that flashlight! I adored it! He was rarely allowed to touch it! And, he buried it! I searched for that light, forever! So, yesterday I was out weeding in the garden a bit. 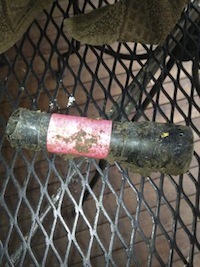 I always put pink or brightly colored duct tape on my lights, so they are easy to spot in the yard. Well, I saw the tiniest bit of pink, and thought, "What's that!?" All of the sudden, it hit me! It... couldn't be?! Is it!?! My flashlight!!!! YES! But, then my heart sunk. Surely... surely it wouldn't work right after an entire winter in the garden? It does!!!! It works! I dried it out and put fresh batteries in, and it works! Willie will never again touch this flashlight! Ever! Go, Coast Flashlights! You are the BEST! I'm so excited! You all know how much I adore Taylor Swift, right? Well, I'm trying to meet her! Never, ever have I asked anyone to "vote" for me, until now, and I'm asking! Tee hee! It's a Z100 thing, and all you have to do is to click on that page. (I think?) It also gives you the opportunity to beat me! So, go for it! We could both win! Today is Girl's day. I'm going to get my hair done! I sure hope it helps, and more than just my "looks". My hair dresser is excellent at head massages, and I have had a migraine for four days, straight. That's not normal! Not even for me. I'm a bit worried. What is it like to see, again? Sometimes I get a little down, wondering why I don't feel good, so much of the time. But, you know... the good part about it, is that when I do feel good? I celebrate, and it feels SO good to feel good! It's kind of fun expecting that the sun will come out, tomorrow, and everything will be better, then! At least I have something awesome to look forward to! I'm at the coast, and Willie and I are having a little down time. Just wandering on the river bank, wondering how many fish are in there, and digging holes. Life is good! There are fish in the Kilchis! There are! "I should have luck at home, But not for me! They're catching steel of chrome, But not for me!" Isn't that how that old Gershwin song goes? It's my stomping grounds! Come on! Not only did our guest Dave have one fish on right away, but he landed another chrome beauty, shortly after! I think, perhaps, he expects a fish with each cast. I think, perhaps, that is the trick. Funny, though. I didn't remember that saying, that confidence, that eternal hope, until they left. "Expect a fish with each cast." Oh, yeah! It all came back to me! Standing in the kitchen, Bill and I got ready to fish. I noted the gear, outside and here. Bill stood tall in his full Cabellas down, next to the kitchen sink. Outside on the porch, Vic and Dave were impeccably dressed in their fly fishing attire. I poked Bill in the ribs and said, "Looks like you are dressed for western, and they, for English?" He laughed. It was true! An equestrian battle between the western and english, out on the river! Here we go! I dressed simply in my plain jane jeans and tennis shoes. I felt I would be the luckiest! That's how it used to be! You know, that gal who doesn't have to try? Fling a cast out there, and 'fish on!" I mean, after all, I live here! I don't need down, nor fly fishing attire, waders, or anything! I can just fish! But again, it's not so for me, any more! I had forgotten the saying that Stan Fagerstrom pointed out. He said I always expected a fish with each cast, and I did! I had no doubt! With every cast, I visualized a fish on the end of my line! I could feel it! See it! I fished with intensity and expectation! And although I had confidence in the end game, yesterday, I had no confidence in my cast. I was nervous with each cast, and quit early. I was tired, and kind of pokey, yesterday. The night before offered little in the way of sleep. I tossed and turned, my legs aching and my stomach a bit unsettled. So, no. I didn't catch anything yesterday. But, I'll tell you! Just hearing about Dave's catch made me a happy girl! Whoo hoooo! Seeing that picture, up above made my day! While they were out fishing, I made a batch of my family favorite "French Breakfast Puffs". Oh, those are naughty, but so, so good! I delivered them out to the river while they were still warm. I remembered once when the kids were little, we were going to make sugary treats and sell them to the fishermen. We'd call our place "The donut hole" and the fishermen would look forward to coming, each day, to see what treats we'd have for them. Hot coffee and donuts! Oh, those were the days! What a glorious day it was, though! It was one of those calm, sunny days where you walk halfway across our lawn towards the river, and you see it. The sun, hitting hard on the river, turning it that deep, forest green that matches the trees that go up the canyon walls. The rapids in the middle, a foaming white against the depths. It takes my breath away. Almost so that I can't move. The dogs rush by my sides, though, waggly tailed and barking, urging me on. I had more fun delivering those muffins to the fishermen. I felt like the feminine side, all clean and girly and smelling like cinnamon. Pretty much different than the fishing me. The one with shrimpy smelling fingers, and with fish scales on my arms. I have been feeling guilty about the loss of that "me". I was trying to explain to Vic, my doc, why I hadn't been fishing as much as usual. "I don't know, Vic. I think it might have something to do with the loss of Andrew. It's just that everything is different." He said, "Life is different, every day." I think he was surprised that simple sentence took me back so much. My Doctor Vic is very book smart, but you know, I think he is very "life" smart, too. I think the saying, "Life is different every day." is going to help me. Life is different each day. And from now on, I'm going to appreciate that, and live forward. Everything changes. All the time. I can "not fish" and enjoy other things without feeling guilt. It's OK. If I want to fish more in the future, I can. And if I don't, I don't. I like to cook, and I like to fish. I like to do so many, many things! So, thanks, Doc. I appreciate you! And thank you, Dave! Thank you for catching a fish! Now I know that they are out there. You know, for when I get out there and expect a fish with every cast! A friend of Andrew's has run into hard times, so I'm letting her stay at the Oregon City house for a couple months. She's the nicest girl, and it just feels good to help someone. Also, she loved Andrew so much. I like having people over that loved Andrew. I did, too. In preparation for this, of course, we had to clean out Andrew's room. That was no easy feat. 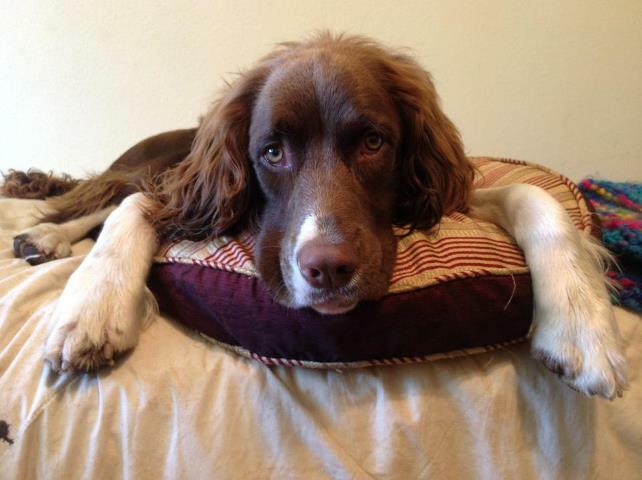 Not only because he was a boy, and my boys are notoriously messy, but because he's gone. Going through his things was difficult, to say the least. David and I prepped for it, rolled up our sleeves, and just went for it. Andrew's been gone for almost 7 months. We both agreed we should do it together, so we wouldn't throw away anything that was important to either of us. As we prepped for this, my mind went back to going through the house that my family grew up in Canby, so many years ago. My Dad decided the house was just too large for him, with Mom Gone. There's that word again. Now, my Dad is gone, too. What are we doing here, still? Sometimes I wonder. We had the garage sale of all garage sales. It just about turned into selling nothing, however. Every single item we picked up was packed with memories.All those canning jars. Some were still filled with age old green beans. Now, of course, those we threw away. But, trying to put a price on those items that would sell was most difficult! An old wooden popcorn bowl that had cracks in it, but that we used for Sunday night Disney movie and popcorn night? Priceless, my heart said. How bout a quarter? :( I handed it over to the lady who was helping us price things. I bit my lip, hard, to stop the tears. It would take so long at first, to finally decide that yes, everything had to go. After a while, we became hardened to the process. "Yep! Sell it!" It's so hard to sell your memories! If you ever have a garage sale for something like this, please...get someone else to do it for you, because going through things yourself, is nearly impossible. "Things" should not be that important. They are just "things". Even if at the time you are handling each "four for a quarter" item, they seem priceless. So, as we were going thru things in Andrew's room, I held up his personal omelet pan that he lovingly kept wrapped in towels, under his bed, so that no one would scratch it. He trusted no one with that precious omelet pan. I'm sorry, but this has to stay. That's the pan none of us were ever let to use. Ever. But, could I possibly use it, now? The thought was foreign to me. I held it in my hands. I felt like I was trespassing. It was the little things, though, that hurt most. His stuffed animals, his books, the Beatles pins he treasured. Do we want to keep them? If we did, David would have twice the amount of things that he already had too much of! Andrew wasn't much for keeping things, but David is. I mean David hoards things. He can't get rid of anything! That Disney tee shirt he got when he was six? He still has it! We finally decided on making a box of memories that would be kept for a get together we are having this Spring for Andrew's friends. Everyone that wants, will have some ashes to spread on the Kilchis river. People can look thru the box of things, and if something means something to them, they can have it. A box of specialty jasmine tea, a bunch of guitar picks, a 7 inch record, a very fine teapot that he loved. Guitar music, his favorite sweatshirt he often wore. Those kinds of things. Come to think of it, maybe I was never supposed to use that omelet pan. A friend of his, Nathaniel, was told never to use metal on that pan, and the one scratch on that pan is from Nathaniel, from when he cooked hamburger in it. Andrew lovingly told me that story. That scratch was the only scratch he wasn't mad about. Andrew just adored Nathaniel, so maybe that pan belongs to him. I think so. Anyhow, it was a rough day. I have been having nightmares on a regular basis, lately. I don't know what that's about. I usually have good dreams, but lately, things are chasing me. I called the thing chasing me a "gitchee goomie" to David. I woke him and said, "David, a gitchee goomie was after me!" David laughed. I didn't. In another dream, I found myself in a car, upside down in the river. Awful things like that, where I wake up panting, sweating, crying. I have to go get Tammy or David or Bill to calm me. I can't figure out why I'm having these, or how to stop them. I almost don't want to sleep. Laying in bed last night, after cleaning his room, I had this thought. What if Andrew walked in my room, right now? Just as he had so many times, before? I looked up as I imagined it happening, and the most awful thing happened. I couldn't, not for the life of me, remember exactly what he looked like. I couldn't remember at what age I last saw him. I have looked at so many pictures, thru his ages, that I couldn't remember where we left off. I bolted up in bed. It was the worst feeling. I bent over, grabbed my ipad and looked for a recent picture. There. There he was. That handsome, sweet boy. There was his his last face. I hadn't forgotten it, after all. But, the thought was awful.. I just never, ever want to forget his face. Never. Ever. On a happier note, my brother David knew how important that popcorn bowl was to me. He must have seen me have trouble giving that one up. Three years or so after that garage sale, he presented it to me. What a present, that was! I still use it, today. Happy belated Birthday to Marty Peterson, Joe Schwab and Bill Hedlund! I love that they have Birthdays on the same day! Joe Schwab's new book is out. "Outlaws in The Big Woods." Have you read his books? They are SO awesome. Bill and I love both of them! They are perfect for our audiences, both fishing and hunting. Not only that, but many people know Joe from our discussion board, so it's fun to think of him in these situations, after knowing him, personally! They say that everyone you know has one good book in them. How bout two? They are both awesome! Thanks, Joe, and can't wait for your next book!!! You can get both of his books at this link. The boat we take crabbing is a new one that Bill just had made, and it's really handy. We use it for small crabbing trips, duck hunting, and tidal fishing. On a calm day, we could even use it for bay fishing, but it would be kind of scary, as the bay can blow up pretty quickly, and this boat has very low sides. Frankly, as you may have been reading, I didn't want to go. I haven't wanted to fish much. I blame it on my son's death and the resulting depressive feelings, but am I wrong? Do I really want to go, and just can't get up the oomph? "I don't really want to go. I'm doing this for your Birthday." Now come on... I thought, as soon as I said it. That wasn't nice! I wanted to take it back. I'm stubborn, lately! Old, sour face-mean woman is trying to get ahold of me! I'm fighting it tooth and nail, though! I am! I refuse to become that person. That person, too hurt by life's torments to keep smiling. I'm a gonna keep smiling, by golly! I have to! I must! That saying, "Satan! Get behind me!" comes to mind. Bill said, "It's good for you to go. It will do you well." "I don't know", I thought. Why the water? The water is cold! Out walking on the river, which I do many times a day offers plenty of "outdoors". There are pretty flowers coming on, already! 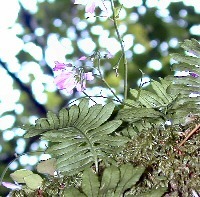 Salmonberry flowers, and tiny white little flowers on the forest floors. Isn't that enough? I love walking the river. Staying "home" and walking the river is my soul food! It wasn't but 10 minutes in Bill's truck, though, before I had Taylor Swift on the stereo, and I was singing along, and smiling, all wrapped up in warm clothes, looking forward to being out on the bay. It did do me good! The air on the bay was spring like and dense. Muggy, even. But, when I was actually on the water, and I'd grab the boat pole to grab the ropes of the pots, my hands became cold. As the pots splashed me and my pants got wet, pretty soon, I was cold! Happy Birthday, Bill! I tried not to mention it. Instead, I scooped up Willie, (yes, there was barely room for Willie!) and plopped him on my lap. I hugged his sunlit warm and warmed both my soul and my body. The entire trip, I was worried about Willie falling in. Not that it would hurt him. Not that we couldn't have him swim to shore, or simply bail him back in, but just that he'd be wet and nasty to be around in the small quarters of this boat! Anyhow, crabbing was not fantastic, as it had been last Fall when we went. The crab (singular) that we did get, though, was full of meat and hard shelled. I think if you were to give it more time, you could limit. We were only out there about 2 hours. Two hours, though, was enough to brighten both of our spirits! It's true, Bill. Getting out on the water does wonders for ones soul. And... it makes me want to do it, again. I'm going to beat this depression! I am! That means I'm going to be fishing, again. Springer season is upon us, and I'm ready! Last night, Bill and I had a wonderfully heaping crab cocktail for his Birthday dinner. We even had some left over! I made an applesauce spice cake with cinnamon cream cheese frosting, which is his favorite. We traegered up some chicken and made a pot of rice and some awesome veggies. Dinner was great! Dessert was better, yet! It's a darn good sign that I can't wait for Springer season. It gives me hope that I'm looking forward to things. Taylor, I can imagine looking forward to, but I can't believe that I have springer on the brain, but I do! That's a darn good sign! Oh! I have to tell you... you know how dogs can't wait to get back to the dock? So much so, that they often jump to the dock, before it's time? I told Willie, "Stay! Stay!" But, he did not stay. He jumped, and made it partially to the dock, and mostly into the water. In fact, he went UNDER the water! He wasn't so crazy about this under water thing. Bill scooped him back into the boat, and the next time I said "Stay", he stayed! Scary. All I know is that I'm not ready to go. Nope. Not at all. I'm not afraid to go, but I am just not ready, yet. I wonder if I'll ever be ready? So, I got up at 6, feeling really well. I went to get a latte at Dutch Brothers, and oh, was it good! I headed to the puppy park. We just had a great time. My legs were doing well, and I walked clear around the park. I threw Willie balls. I visited with the other dog owners and their dogs. Just had a nice morning. It was brisk and sunny and lovely! On the way home, I decided to go to Fred Meyers, as I heard they had plastic pools in. I need one for Willie. They didn't, but Bi Mart did! As I was purchasing the pool at the counter, I became really dizzy. So much so that I imagined telling them to call 911. I made it out the door, though. I didn't have to give in. Then, I was so dizzy and cold and sweaty, and I had a terrible time trying to get the pool in the car in that shape. I finally sat down. When I did, that awful and very same feeling that when my aorta dissected, came over my chest. Oh, NO. That isn't a normal feeling. The first thing I thought, though, was "What will Willie do without me? What about David? Should I call Bill right now, or 911?" Neither. I didn't do any of them. I decided to try to drive home. David could call Bill and 911. I know! I know! Not very smart at all. But, I'm stubborn. You know that! Willie knew I was in distress, and it just broke my heart. He took his sweet little paw and with these soul filled eyes, lay in on my forearm. Oh, my. Not only was my chest burning, but now it was breaking in two. I'm just so grateful that David and Bill both love Willie, just in case. It is about a mile and a half home from Freddies. I drove ever so slowly, just in case I went out of control. I was shaking and my heart was beating so hard. I tried to feel my pulse in both arms, but decided I'd better just drive. Carefully. I passed a policeman. Should I? Should I pull over and ask for help? The thought of an ambulance being called put me off and I continued for home. When I got home, my neighbor said hi. I quickly said Hi, leaving my purse in the car, and went to get David. Before I got David, though, I was intensely hungry. Could it be? Could it be low blood sugar? Is that all this is? I was ravenous! It was 39 degrees out, and I had beads of sweat all over my body. I was so hot, so tired, so faint, so painful... and so scared. I grabbed a donut with one hand and poured a bowl of cereal with the other. I couldn't eat fast enough, or just plain enough! I had another bowl! Another donut! And then.... I rested, still not having woken David or Tammy. I felt better? I did! I didn't die! Yes. I'm going in on Monday to get a CT to see if my aorta is leaking. But, it's been 2 hours, and I'm still good. I just can't figure out what the heck that was! I do know, however, that I was so sad to be leaving. I'm not ready, yet! I didn't want to die! I just kept saying to myself, "No... not yet! No!!!!" Thoughts of being in the hospital, and being so sick whirled through my mind. Just plain "NO!" Anyhow... I'm so glad to be alive! Do you have any idea how much? I do! I guess I left the ball hanging, there. I'm doing fine, for anyone who asked. I'm doing medical testing all week, as none of the docs can find anything wrong by just looking and listening to me! I did blood tests yesterday for diabetes and things, and then I have to get a CT on my aorta. Anyhow, I'm at the coast, and Willie, Bill and I are having fun watching Spring happen! It's so rainy and windy, we can't really do anything. The river is way up. At least it was yesterday. I can't wait to look, today, to see if it's fishable because all that water? I bet it will bring in some steel! The day I got here, the water was low, and I saw my first Steelhead redd of the season. But, then the water came up. I hope it didn't ruin her nest! I still maintain that what happened was the absolute scariest thing I have experienced, yet. (Well, since my dissection!) It's weird that I'm fine, now? Just so bizarre! But, thank God! You really need to be at the river every day in order to watch things progress naturally into Spring. Just sitting on my duck chair out on the river, the level of the water changes, before my eyes. Yesterday I watched a chunk of land fall into the river, from the bank. Thank goodness I was back far enough, or I would have gone with it. I 'd sat in that very spot, many times. My eyes, gazed down into where it was deep and dark. Splush! The dirt cracked and fell, taking a small tree with it. I saw it happen! And now, when I go down to the river, a new landscape is there. I watched it happen. As I sit safely back from the water, all around me, little green shoots sprout out of the dried brambles of salmon berries, and little pink flowers explode like fireworks. Sun rays shines brightly on the new blooms, show casing the works. It seems to happen all in one breath. Last year was the first year that I wasn't the first one to discover the arrival of the goldfinch. I remember the phone call I received, sitting on my bed in Oregon City. My heart sunk. Over such a silly thing! A goldfinch spotting! Bill saw it first! Usually, I sit here in my chair at my computer in Tillamook. Little birds flit and go at the feeders outside my window. Junco, chickadee appear happily and go... and all of the sudden, I see it! Was that? Yes! A flash of buttery yellow! This year, I'm going to be here! I watch like a hawk. By golly, the days I'm here, I'm just not going to miss it! I did see one early one, already, but that doesn't count! The flock! I'll be here for that first flock! I'm getting frustrated, not having a home-home. I have two. That's fun for a little while, but I miss having a home-home. The boring but yet comforting home that you get tired of, but feel homey about. The home that makes you want to get away on vacation, and yet be so happy to come home to. I miss that. I miss leaving a garden for a week, and be so amazed at the changes that happen while you are gone. The river is my home, but I do enjoy my time at the city, too. Both feel like home. You can't have two, can you? I thought so, but now I question. In my future, I see just one. Thinking about how that will happen makes me tired. But, it will happen! I'm awaiting test results today, and making appointments for new tests. Sigh. Tiring, also! Bill and I are looking out at the river, saying that yes, we are fishing, today! The river is probably the most perfect I have seen it since the last time it was perfect! LOL. It does happen quite a lot, but at the same time, it seems like ages, since the last time. 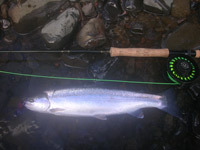 This time, I will hook a chrome native steelhead and feel the rush of excitement that it brings. I know it will, because I will expect a fish, with every cast! 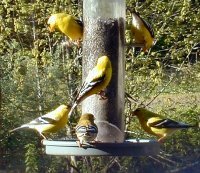 Just the same way that I expect a buttery yellow flock of goldfinch, every time I glance out my window! It is just one of those days. One of those perfect days that you expect the best. I went to the CCA banquet last night here in Tillamook. It was so well put on! Usually, these banquets are put on by endless hours of work by "the girls". Usually, the wives of the guides get together and work so hard! Not this tournament, though! I am more than impressed to tell you that Travis Moncrief, long time ifish guide put on this tournament, himself! I was browsing through the neatly prepared brochure, wowed by the auctioneer and impressed by Dave Schamp, the host. I mean, "wow!" It was all done so well! From the moment you opened the non conspicuous, dark door of the Elk's Club, the room exploded with life! I was welcomed by registration gals on one side, and Jerry Dove selling tickets on the other. Then, I walked in the main room, and wow! People talking and laughing, aisles of goodies and prizes to bid on! It was just so fun! Tillamook loves a party, and they really got behind this one! The buisnesses donated all kinds of goodies, from Traeger barbecues, the best of shot guns, art prints signed by Gary Loomis, and so, so much more! And then... as I was talking to Katy Moncrief, I found out that Travis was behind the whole darn thing! I am so impressed by both Travis and Katy! I just can't say enough about the gals behind the best fishing guides. I've written about it, before, but you know, it just keeps impressing me! I was blessed to sit by Katy Moncrief. She is one of those that gals that you just have to admire. She's always smiling, always kind, and she is so beautiful! Not only are both Shana and Katy 'run way model beautiful', but they are partners in some of the best fishing guides in Tillamook. I used to say that behind every good guide, was a good woman, but I realized how sexist that sounds! Oops! It's just that it becomes so apparent to me, that it takes a team to run a good business. And Fishing Guide businesses are no different. I probably am sexist, I guess. I'm just old fashioned, and I was raised to think that women should stand behind their man. But, "behind"? How about "with"? I don't know. I guess I am just sexist. :) I apologize! What I'm trying to get across, is that we shouldn't forget that those guides who net the fish for us? Who run the big boats, and impress all the people on the water? Well, there's a silent partnership there. One that is so important, and allows those guys to sustain what they do! No matter whom, there is a business behind the glamour of it all! Just look around at the next fishing banquet that you go to. See all those gorgeous wives, sitting by their sides? They do SO much more than just look pretty! OK, I give up. This is a hard column to write for me, without someone rolling their eyes! I was talking to Tim, and oh, you know how I love to pick the brains of those guides about fishing! We were talking about fishing methods that are new and quite effective on Steelhead. I was asking about that new two hook rig, I was reading about on ifish. Did it work? "Yes," Tim said. I can't remember the exact quote, but he told me that many new methods hit the Oregon Coast for steelhead, that were primarily used in Alaska for trout. They work! Yes, they do! But, you have to fish with what you are confident with, because when you are confident, you pay attention! I think that goes along with "Expect a fish with every cast!" It does! Doesn't it? So, no matter what you fish with, whether it be a new rig you read about on the board or whatever, if you aren't confident, it just won't be as effective! I asked Tim if he used that new rig, and he doesn't. He uses what he is confident with. What that is... well? You'll have to book a trip with him to see! I read on the board with intense sadness. Another parent loses a child. It hasn't been eight months, since I lost my own 25 year old son, Andrew. It's been a very difficult time for me. Knowing the tears, the sadness, the loss of hope, the grieving I've been through, of course you just don't want that for anyone! I questioned God. I couldn't understand, and still can't, sometimes, why? Why would God put me through this? I have hope, though. Hope, in my Heavenly Father. I simply don't know how people on this earth can get through things without faith and hope. We live in a world where we believe that if it sounds to good to be true, it is. We are taught this from the wisest of our people. It's just not always so, though! My Heavenly Father sounds too good to be true... but thank goodness, I believe that He is true, and so are all the miracles He has performed. I was raised in the church, hearing all of the Bible stories about Jesus Christ. The lesson about Him rising from the dead on Easter Sunday, though, always sounded... like a fairy tale -too good to be true! It was several years into my young adulthood before I could really, really believe it all. I have trouble admitting that, but in this world where there is so much doubt, it's just a difficult task to believe that a man could rise from the dead! At this point in my life, I have witnessed miracles, and I believe! It is such an awesome feeling to have faith! "Jesus Christ is the same yesterday, today, and forever." Miracles still happen! Since my son's death, Easter has a new meaning for me, and it's totally awesome! No one understands my pain and grieving more than my Heavenly Father. He lost his only son! God can relate to what I am going through! If God wants the very best for me, and if if He doesn't like to see us sad, and promises in Heaven that there will be no sadness, then I believe that I will see my son's sweet smile again. If God can raise His only son from the dead, than I can sure well believe that God loves us, every one, and can do amazing miracles in our lives. On this beautiful Spring morning, with glorious sunshine and warmth, I just believe.... and I feel great comfort, today... knowing that our Heavenly Father went through this same sadness, and knows how I feel, and how I grieve. In reality, I have so much more to be thankful about, than what I have to be grieving about, but that just doesn't matter, when my heart is so broken. I have a long ways to heal, but at least I have a foundation to work with, miracles to expect, and my Heavenly Father, who holds me in the palm of his hands. I'm headed out to go to the Doggy-Easter Egg hunt at Mary S Young park. The sun is intensely shining. The sky is turning a darker blue, with each day that marches into Summer. I still have so much to be thankful for, so much that makes my heart soar. I miss Andrew every moment of every day, and I have so far to go. But, I know... I just know that I will see him, again.